TORONTO, ONTARIO--(Marketwire - Aug. 13, 2008) - Lynda Bloom, President and CEO of Halo Resources Ltd. (the "Company") (TSX VENTURE:HLO)(FRANKFURT:HRL), is pleased to announce that a result of 5.1% zinc and 0.48% copper has been reported for a bedrock sample, collected as part of an extensive bedrock chip sampling program, that occurs at the northern end of a 250 m long trend of elevated zinc and copper values coincident with a geophysical VTEM anomaly (to see map please click on: http://media3.marketwire.com/docs/hlo0813.jpg). Bedrock chip sampling has located the surface expression of the Lost Lake deposit and expanded the potential strike of the deposit at least 250 m north of previously known drilling. 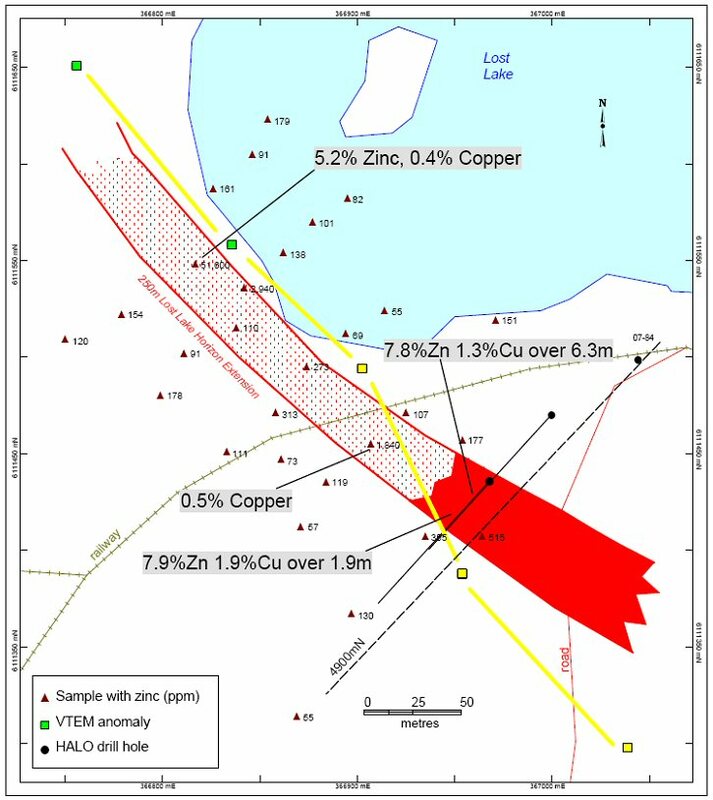 Section 4900E, which previously defined the north end of the known deposit included intersections up to 1.3% copper and 7.8% zinc over 6.3 m, which represents the highest grade and thickness reported to date on the Sherridon VMS Property (see press release March 18, 2008). "The Lost Lake massive sulphides have been intersected in drill holes over a strike length of 500 m with some of the better grades and thicknesses reported for northerly drill sections. The potential to expand the deposit an additional 250 m is an exceptional opportunity particularly with such strong evidence that the deposit extends to surface with consistent high zinc grades," says Lynda Bloom. "The expanded Lost Lake zone will be a high priority winter drill target." A NI43-101 compliant report is in progress to report on resource calculations for the Sherridon VMS Property Cold, Lost and Bob Lake deposits; a NI43-101 compliant resource calculation for Jungle Lake was issued in January 2008. The above information has been prepared under the supervision of Stephen MacConnell, who is designated as a "Qualified Person" with the ability and authority to verify the authenticity and validity of the data. The Sherridon VMS Property covers an area of over 20,876 hectares and hosts the past-producing Sherridon Mine that was operated by Sherritt Gordon Mines from 1933 to 1950 and produced 7.7 million tonnes of ore with recovered grades of 2.46% copper and 0.8% zinc. Results from an airborne geophysical survey completed in the summer of 2006 identified an additional 122 targets. Over 28,000 m of diamond drilling have been completed since November 2006 and drilling continues year-round. A NI43-101 compliant resource estimate for the Sherridon Jungle Lake Zone has been filed on SEDAR and resource calculations are planned for the nearby Cold, Lost and Bob Zones. The property is located only 70 km northeast of the mining and metallurgical complex in Flin Flon operated by HudBay Minerals Inc. Future development of the property is facilitated by the presence of an all-weather road and railroad access as well as a power line and communications tower. Halo is a Canadian-based resource company focused on the acquisition of near production base and precious base metal deposits. Currently the Company owns or has an interest in 3 projects: Duport, which is an advanced stage gold project; Red Lake, which is a gold exploration project, and the Sherridon project that is a combination of mature and grassroots volcanogenic massive sulphide (VMS) copper, zinc and gold exploration opportunities. The Company is operated by an experienced management team and backed by a strong network of mining financiers. The Company's growth strategy is to develop a diversified portfolio of advanced mining projects. This news release presents "forward looking information" within the meaning of the applicable Canadian securities laws that involves inherent risks and uncertainties. Forward-looking information includes, but is not limited to, information with respect to the proposed private placement. Generally, forward-looking information can be identified by the use of forward-looking terminology such as "plans", "expects" or "does not expect", "is expected", "budget", "scheduled", "estimates", "forecasts", "intends", "anticipates" or "does not anticipate", or "believes", or variations of such words and phrases or state that certain actions, events or results "may", "could", "would", "might" or "will be taken", "occur" or "be achieved". Forward-looking information is subject to known and unknown risks, uncertainties and other factors that may cause the actual results, level of activity, performance or achievements of Halo to be materially different from those expressed or implied by such forward-looking information, including but not limited to: risks related to financings; risks related to the integration of acquisitions; risks related to joint venture operations; actual results of current exploration activities; actual results of current or future reclamation activities; conclusions of economic evaluations; changes in project parameters as plans continue to be refined; future prices of gold and other minerals and metals; possible variations in ore reserves, grade or recovery rates; failure of equipment or processes to operate as anticipated; accidents, labour disputes and other risks of the mining industry; and delays in obtaining governmental approvals or financing or in the completion of development or construction activities. Although the management and officers of Halo Resources Ltd. believe that the expectations reflected in such forward-looking information are based upon reasonable assumptions and have attempted to identify important factors that could cause actual results to differ materially from those contained in forward-looking information, there may be other factors that cause results not to be as anticipated, estimated or intended. There can be no assurance that such information will prove to be accurate, as actual results and future events could differ materially from those anticipated in such information. Accordingly, readers should not place undue reliance on forward-looking information. Halo does not undertake to update any forward-looking information referenced herein, except in accordance with applicable securities laws. Trading in the securities of Halo Resources Ltd. should be considered highly speculative. About this company Halo Resources Ltd.